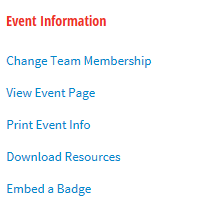 To access your fundraising portal, click the LOGIN button in the top right hand corner of the website. Your username and password were provided to you in your registration confirmation email. If you forget your password, simply click ‘Forgot Password’ and you will be sent an email to reset it. 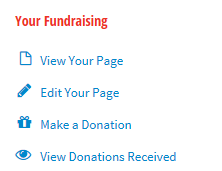 Once logged in, use your Fundraising Navigation Tab to explore different areas of your page. Your donations tab, will show you all the details you need to know about who has made donations (and help you to thank them as well!) If you need to add any offline donations, here is the place to do it.